It is always great to be able to laugh at yourself. Thank you Jerry and Elaine. Hope you're well and enjoyed your summer. ok, if only I wore them nearly all the time. ground. It's less swollen but still not normal. it's a lot better or not -- to see what you think. Dr Blake's comment: This particular patient has both Hallux Rigidus and injured sesamoid, so course is slow. The last MRI was 5 and 1/2 months ago, so I will order an MRI something after the 6 month anniversary to check on bone healing. I like to wait 6 months between MRIs, the longer the better. First, I am truly grateful for your thoughtful diagnosis of my injury over the last couple of days. Your willingness to make time and accessibility were very gracious and generous. Moreover, I very much appreciated your prompt voicemail with both the radiologist's and surgeon's diagnoses, respectively. General daily getting around - while I am not planning to hike Mt. 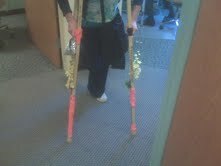 Tam anytime soon, what duration of walking with the crutches is sound? Reclined exercise bike - I believe that you said that it's o.k. As of when may I begin using it? I believe you said to keep the boot on my right foot and use it rather than isolating it and solely using my left leg. Please advise. Pilates - is that o.k. if I isolate my right from the exercises requiring that leg? Would it be possible to get a letter for a temporary disabled mirror hang tag from the DMV? For example that would preclude several stories of steps at my Athletic Club. If not, would be possible to email me a letter stating my injury on your letterhead for the Club at a minimum? To follow-up on that topic, I will be insured through a high deductible, individual Aetna PPO plan starting Oct.1, which is when my COBRA expires. While I am seeking a traditional job partially for this reason and ideally will have secured one by the the end of the year, I would ideally like to hold off on any high cost procedures until 2013 if feasible should that I not be traditionally employed by the end of the year. I think I have been suffering from short leg syndrome. Hip hike, shoulder hike, irregular arm swing, ONE flat foot and weird walking gait. My legs are anatomically even. This has resulted in bulging disks in my lower back and a lot of lower back and lateral knee pain. Your blog seemed to touch upon my symptoms better than any doctors here (Israel). I was hoping you could guide me as to how I can FIX the problem? Perhaps techniques I can show to a practitioner here? Thank you so very much for your email. I had the pleasure of visiting your incredible country in 1989 and was moved deeply spiritually. What you are describing is called "Functional Short Leg Syndrome" where there is asymmetry of motion between the 2 sides, but the legs are structurally the same length. There are a hundred and one reasons for this to occur (like back tightness from bulging discs), and the art of this medicine is to discover ways to make the unevenness go away. Golden Rule of Foot: The body seeks symmetry of motion. The following is my order of events, but you and your medical team go look at this in another sequence. First of all, take the Standing AP Pelvic Xray in normal stance to make one hundred percent sure there is no structural component. If some structural component is found, even as small as 1-2 mm, treat it. Note the long right side at the hip level with the marker noting Upright. The next thing to do is correct the unilateral (one foot) pronation or flat foot. You want to design 2 unique orthotics to correct for this asymmetry. The flatter foot should actually have more correction, but however it is done, the end result is that both feet are functionally even with the weight at push off through the 2nd toe. The next step is to re-eval the limb dominance. The dominant leg is the leg you are putting more weight on. Has your possible lift and orthotic corrections evened this out? Is the unequal arm swing better? If no to either of these 2 questions, look for muscle imbalances (tight or weak muscle differences between the two sides), and begin slowly correcting. The tightnesses from the calf, hamstring, hips, and low back should be the easiest. The weakness differences between the two sides is slower and more difficult and can take months and months. But, you should see the progress. I had custom orthotics made - I'm curious what you mean by them fixing the pronation? I thought if anything they would simply make my body used to it? What about simply strengthening the calf muscles on the pronating foot could that help the pronation? The following photos are on a patient who had a severe complication post ankle fusion where the foot was left inverted to the ground. Slowly over the last 8 years the foot has become more "C" shaped with marked weight bearing along the lateral side of her foot, and little to no weight bearing medially (big toe side). She is presently speaking with 3 surgeons and deciding on the most corrective surgery to re-center her heel and get her stable on the lateral side of her foot (4th and 5th metatarsals). After a line was drawn to bisect the heel while the patient lied prone (on stomach), the patient was asked to stand up in her normal stance of gait. The paper post its form a straight vertical line next the heel bisection to demonstrate the inverted position of the heel. Careful measurement reveals that this line is 5 degrees inverted. Root Biomechanics states that any inversion of the heel over 3-4 degrees will cause lateral instability and the problems associated. Here the photo shows the gross asymmetry of the body with the left heel everted (pronated) and the right heel inverted (or supinated). The body seeks symmetry in function, so this poor biomechanical position forces the body to attempt compensation. In this patient's case, the compensation has lead to gradual foot, ankle, knee, hip and low back symptoms. As a podiatrist, since the right ankle is fused in this position, and the subtalar joint is rigid and arthritic, I can not change that position. If the surgery can straighten that heel position, and I suggest even erring on shooting for 2-3 degrees everted, I know I will be able to center the left side with orthotic devices. This photo focuses on the lateral weight bearing on the fifth metatarsal base. This is extreme pressure which produces many symptoms, and I have probably attempted 8 or so different orthotic versions to attempt to help. Some have been at least somewhat helpful. In another situation, if the ankle was not fused, I could generate force with the orthotic device to evert the heel lessening the force on the lateral midfoot. This photo emphasizes the normal straight lateral border, instead of the C shaped unstable border of the right inverted foot. The surgeons must decide during surgery if the only surgery necessary is to straighten the heel (possibly with a subtalar joint fusion), or if more than that is necessary (ie triple arthrodesis, lateral column shortening, soft tissue releases, etc). I apologize for the orientation of this photo. What I attempted to show is that the fifth metatarsal head on the right foot was 1 inch medial to the lateral malleolus when the foot was maximally pronated, and is normally 1-2 inches or more lateral to the lateral malleolus. This can be a reliable landmark in surgery to decide if the surgery will do what it was intended to do. So the 5th metatarsal is at least 2 inches too far medial. Here, on the left side, the fifth metatarsal head is 1 and 1/2 inches lateral to the 5th metatarsal head when the foot is maximally pronated. This is a more normal relationship and ensues good even weight bearing of the entire foot. 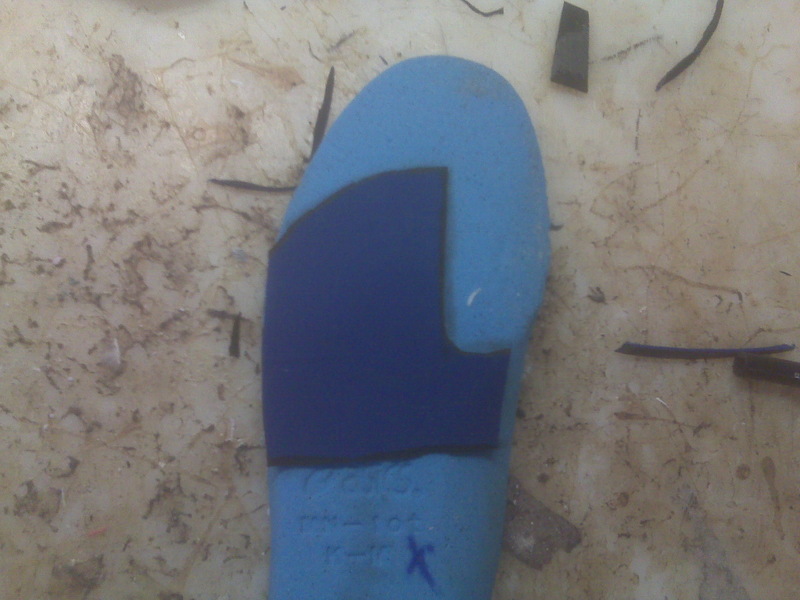 Here is the patient is in shoes and orthotics to attempt to correct the heel positioning. You can see that the right foot is still inverted and the left easily centered. I just sent this to a patient with significant pain in the bottom of her heel (lower right). The MRI on the lower right clearly shows the gap in the plantar fascia not seen in the MRI seen on the lower left (Thanks Cheryl). The arrow on the lower right shows the gap with the dark plantar fascia seen to the right and left of the arrow. The initial treatment is casting in the removable boot and an EvenUp on the opposite side placed on the patient's shoe (upper left). The sunset from June 2009 minutes after my son Steve married Clare in Hawaii (upper right). Maryann (name changed), Here are the 4 specific foot strengthening exercises I recommended a long time ago, and then proceeded not to send you. After you review them, you can ask me more specific information. Remember not to do these exercises if there is any pain involved. It is important when doing the met doming and toe theraband not to curl your toes. Start with one set of ten, and over 3 months, gradually increase to 3 sets of ten with 20 second break between. Slowly increase the tension on the theraband, as long as you can avoid curling your toes. 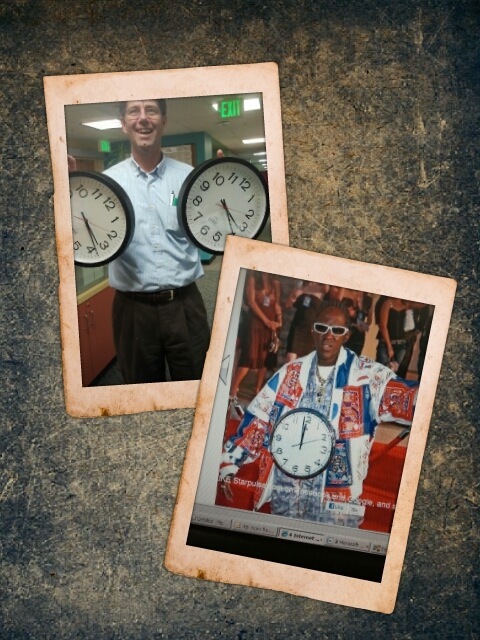 Can You Tell Which Dr Blake Has Too Much Time On His Hands??? Hi Rich – Hope all is well with you. I need a professional favor. I hurt my toe and need to know if I should come see you or if it will get better on it’s own. Here’s the deal – about 2 weeks ago I went running in shoes slightly too small in the toe box and the big toe and second toe off my right food were jambed together (unknown to me as it did not hurt). When I removed the shoes I noticed a swelling on the right lateral border of the nail bed near the base and it hurt when I pushed it – it was flesh colored no hematoma. It has not gotten better or worse since that time. It hurts when I scrounge my toes together and fold them down. It hurts when I am in bed when the covers push on it heavily but is ok otherwise – I can even run and ride and it doesn’t particularly hurt. However when it hurts it’s significant. I have attached photos from this morning so you can see the offender. It is red and swollen relative to the big toe on the left foot. Now a little back story – about 3 months ago I think I broke a bit of the bone on this same toe by smashing it into a step in my house at very high speed. Hurt like heck for several weeks – but I took a (dental) xray of it and I determined it would be fine and so it was after a few weeks – that is what caused the purple line across the nail. I have attached that film as well in case it is pertinent. By the way I don’t want you to start self-diagnosing any gum problems you may develop! Steve came in about 3 days later and I removed the offending nail border back to the cuticle. Green pus came pouring out so it had become infected. He is soaking it in warm water with a tablespoon of Epsom salts (table salt just fine) for 30 minutes or more twice a day until all of the redness is gone. He is keeping topical antibiotic and a bandaid on as long as there is an opening. The soaking should pull out the remainder of gunk from the toe. Golden Rule of Foot: When dealing with an infected ingrown toenail, soak as long as possible and twice daily until the redness and pain begins to resolve (normally 2-3 days). Around 5 months ago, I increased my level of activity significantly (too much too soon) and I got tendonitis in my right foot on the peroneal tendon. 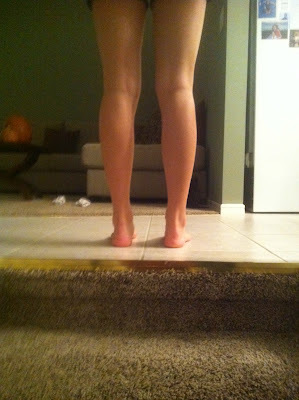 I was limping around for about 3-4 weeks and was shifting the majority of my weight onto my left foot. Dr Blake's comment: Golden Rule of Foot: Avoid limping with a passion!! Limping causes abnormal forces throughout your body, and something else may be injured and it is usually worse than the original injury. On May 11th 2012 my left foot started hurting around the 1st,2nd and 3rd metatarsals (throbbing pain). I rested for a couple of days and it went away, then I walked again and the pain came back even more intense. By the end of May I was limping really badly and my big toe was tingly and painful. Palpating the sesamoid bones induced a lot of pain. At this point even sitting in a chair and letting the big toe touch the floor caused me a lot of pain. I decided to non-weight bear for 3 weeks. Dr Blake's comment: Great, this is much better than limping and attempts to create a pain free environment for ultimate healing. The pain reduced dramatically but I still felt some tingly sensations and I had lost the capability of flexing my toes down. When I tried walking it was extremely stiff and I had a lot of discomfort at the 'toe-off' phase of gait. I am a 3rd year Kinesiology Student (21 years old) so I knew that there would be a lot of stiffness at first. Dr Blake's comment: If the sesamoids are involved, you must avoid pushing off for several months or you keep irritating. I walked for about 1 minute, and the intense pain came back again. 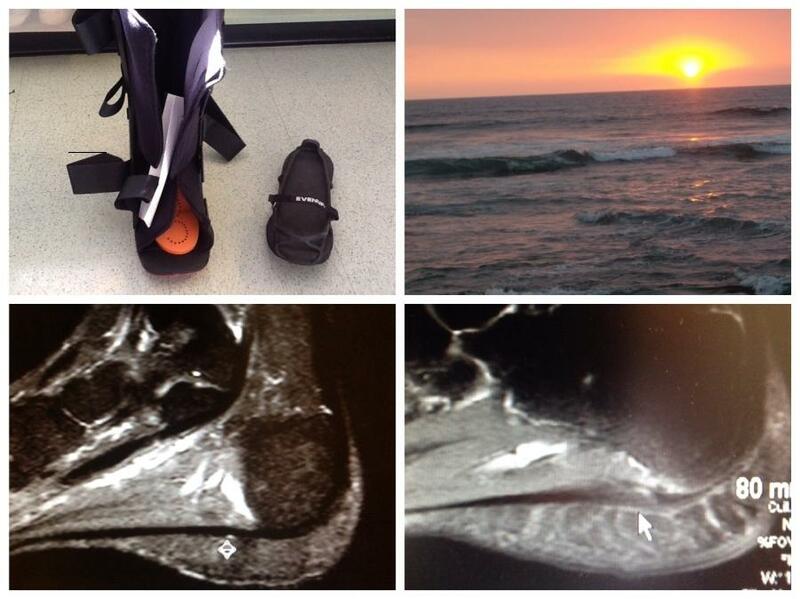 I was extremely discouraged, and was starting to suspect a stress fracture. I got an x-ray around July 20th and my doctor said everything looked fine, but from what I have read online, sometimes x-rays don't show a stress fracture unless there is a clear break and a gap between the pieces. Dr Blake's comment: Definitely right, sesamoid injuries that cause intense pain need an MRI.!!! On July 27th, I received a used exogen 4000+ system off eBay and began using it. Around august 28th my left foot didn't hurt when I palpated the sesamoid bones and I could walk around (with limited dorsiflexion) with no pain, but some stiffness still. I decided to go back to my Doctor and ask for an MRI. He immediately told me no, because family doctors in Canada aren't really allowed to give MRI's especially for something non-life threatening. So I convinced him to get a bone scan. Dr Blake's comment: In San Francisco, there is an MRI facility almost on every block, and you can self pay for around $575 for a foot one. See if you can self pay, and pay in small installments monthly. My bone scan was scheduled for September 5th. I decided I could walk around in the hospital because my foot wasn't as bad. I should have asked for a wheel chair, because the day after my sesamoids were throbbing and my foot was a bit swollen. On September 10th, I got the results back from the bone scan, which said there was increased bone activity at the first MPJ and Sesamoids. I saw two different doctors. Doctor 1 told me that based on pain upon palpation of sesamoids and the bone scan results, it is indicating a stress fracture. Doctor 2 said the results were essentially normal, and I should just do physio and use orthotics. I was a bit offended by what Doctor 2 said, because I have tried physio, non-weight bearing, orthotics, everything essentially for 5 months and I still can't walk. Dr Blake's comment: Basically both doctors are right, but they are in 2 different phases of rehabilitation. Because of your length of time since onset of pain, you should be where Dr 2 has you--The Restrengthening Phase. But you are not, you are in Phase 1: Immobilization/Anti-inflammatory Phase. You need to be in a removable boot for 3 months, evaluated every month, and doing ice and/or contrast bathing 3 times daily. Avoid NSAIDS since they can slow bone healing. Keep up the Bone Stim for the next 6 months, it is great to get those bone forming cells working. Doctor 1 happens to be a fill-in doctor at my family physicians clinic and Doctor 2 is my family physician. Doctor 1 wanted to send me to a sports medicine specialist, but Doctor 2 (since he is my family physician) cancelled the referral to the sports medicine specialist. I feel like I am getting no help from my Doctors here in Canada, I have no options left because my family physician is making it his goal to make sure we never know whats going on with my foot. My last option seems to be going to rheuamtologist that I was referred to several months ago and asking him to refer me to a private MRI clinic which I will pay for myself. Dr Blake's comment: Wow!! And yes, you need to see someone to get your baseline MRI, put you in a removable boot (around $75 from www.mooremedical.com), and have some compassion. Remember you are getting the MRI to document what is going on, but also most patients have a second one 6 months later. So, the first MRI is a crucial baseline to document the changes seen in the second MRI (if needed). 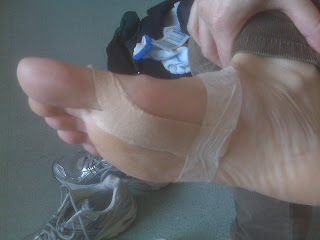 I am going to buy some kinesio tape so I can do the Spica taping for hallux limitus. I will also be buying some Dancers pad to use in conjunction with my orthotics (did I mention that I over-pronate?). Maybe a rocker bottom shoe or a shoe with a wide toe box will also help? Dr Blake's comment: You will heal this because of you are thinking through everything. The only rocker shoe I am suggesting patients try right now is HOKA running shoes. The others seem too unstable, especially for pronators. But if you feel unstable in them, return them instantly. 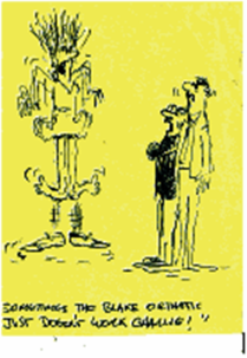 I have only seen the HOKA Mumble (sp? ), but I do not see that one advertised. I would be remiss not to talk diet. Developing a stress fracture from limping is still not common. Probably more common in pronators, but how is your diet. Do you eat red meat? Are you getting 1500mg Calcium and 1000units Vit D daily? Are you too over caffeinated? Do you eat too much sugar? When looking at bone healing, you need to use orthopedic principles but they may not work if your diet is off. Something to think about. I appreciate any help, I know your very busy running your own clinic and answering questions on your spare time, so I am very thankful for your advice. I am very slightly anemic, but I have increased my red meat and vitamin B consumption. I lived a very sedentary life style for most of my teenage years (addicted to video games) and didn't eat correctly. Maybe this made my bones particularly fragile, muscle imbalances and other problems I don't even know about. I tried breaking out of this life style too quick and injured myself as a result. This is just my view on it. I am taking 1500 mg calcium through supplements and 2000 IU vitamin D daily for about 2 months now. I also drink milk, and eat yogurt regularly my entire life. I have especially tight calves, which I know increases pressure on the ball of the foot, I am currently stretching it 30 seconds daily. I wish I could fly out to San Fransisco and get an MRI (you don't need physician referral? ), but how can I travel when I am in the immobilization stage of recovery. In Canada I need a physician referral and I think also I need to leave Ontario and go to Alberta to get a private MRI. Thanks for the opportunity to seek your opinion. My 18 yr old daughter has an ongoing foot problem. She is depressed, sad, has given up hope, ... every day she struggles with the physical pain and is emotionally crushed. She has changed from a happy kid to a sad, depressed teenager with a foot injury that never ends! The current diagnosis is Posterior Tibial tendonitis. She had surgery 16 months ago to remove an accessory navicular ... which they thought was causing the dysfunction in the foot?? She originally twisted her foot in a basketball game when she was 13. The foot seemed to heel ... but she re-injuried it, and the foot (left) started to collapse if she were to start running again. It was 2 years before we started to learn about the Posterior Tibial tendon - and made efforts to strengthen and re-train this tendon. Seemed that the accessory navicular was creating an unstable attachment for the tendon to do its job supporting the foot. Finally, surgery was suggested - and performed on May 31, 2011. Casted for 6 weeks, rehab for several ... when she tried to run, the pain and problem returned - and has been problematic for the last year! Recent MRI shows some tendonitis in the Posterior Tibial Tendon. She struggles every day with pain (and dysfunction) ... and the mental toll of missing sports for 4 years has been heart breaking - she was an absolute star runner, basketball player, tennis - a real all-around star ... and LOVED to play! Four years on the sidelines - our family life has been transformed ... daily sadness, despair. We are lost with what to do. Doctors seem stumped, PRP 8 weeks ago - no response. Physiotherapist don't know what to do. Try again with different orthodics? I can send more details? I have copies of the MRIs. Dan, I am honored to share some of your burden. Thank you so very much for contacting me. First of all, posterior tibial tendinitis does not cause this, but posterior tibial tendon dysfunction can. The MRIs should give us a clue to her pain, but she may need some diagnostic injections into the various joints in the area to see where her pain originates from. The two Golden Rules of Foot that initially apply are: Find the Source of Pain and Create A Painfree Environment. Please fed ex any tests to Dr Rich Blake 900 Hyde Street San Francisco, Ca, 94109, USA for my review. The tests available for this syndrome are MRIs (so I should look at what you have), X-rays with obliques to pick up that side of the foot, bone scans, ultrasonography, CT scans, diagnostic injections, nerve conduction tests, thermography, and exploratory surgery. The last I would save until the other tests have been done. Your daughter has all the right to be very depressed, but you guys must be her strength and fight to get these tests done, etc. Make this a project for the next few months to begin to get a handle on this. Secondlly, immediately Create A Painfree Environment. If this requires a removable cast, a more inverted orthotic, a Ritchie Brace or another AFO, a Roll A Bout, crutches, whatever, and in what ever combination it is crucial. It is crucial to know right now what it takes to make her pain free all day long. That is vital information for the treating physician. Thirdly, the past is the past, and right now we do not need to focus on the last 4 years, but I do need to know what the docs or the PTs are finding (i.e.. collapsed arch only on that side, positive tinell's sign at the tarsal tunnel, limited subtalar joint motion, inability to contract the posterior tibial tendon, etc). Basically, what are the clues she is giving us that we can use to help her. So Dan, I will put any new correspondence, etc on this same post. Let us see if we can begin the process logically. This is so highly unusual that I know something is being missed. Hopefully we can find out. Please send me a photo of her standing of the back of her heels from about 3 feet behind her centering the camera in the middle of both legs. I am very appreciative of your caring attitude and willingness to help my daughter. I have the MRIs and reports ready to send. My daughter will work on the history later today. I'll also get a few photos taken to send as well. Next ... will be getting some of the testing done. I will try with the doctor who has been working with her this summer; he tried the PRP injections in July - can likely get the testing ordered. Also, we'll explore some of the solutions to get the current pain under control. As things move forward, if you need to see her we can arrange to do that. We are in Ontario. Flights typically out of Detroit. This video sent shows the common area involved by the posterior tibial tendon. This photo shows a slightly more pronated left foot, but only slightly. That gives us great hope that the injured left foot can be supported by standard orthotic devices with some inversion in the RX well. 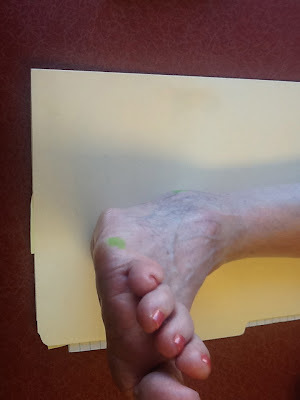 Susan presented to my office with mild stiffness and soreness in her big toe joint. Here was a summary email I sent her of what we had discussed. Hey Susan, great to see you again after 30 years or so. Here are the main points of our discussion. Pad the top of your foot in tight shoes if you can find a spot that gives you less pressure. Avoid bending toe at least for the next month until you email me. This is not the time to increase range of motion. Go Shoe Shopping in Paris within the next few weeks. Review my blog on Hallux Limitus so you get some idea on the problem. Hope all this helps. Rich There are so many other things to do. One of the top sports medicine podiatrists in the San Francisco area is Dr Jenny Sanders. This video comparing the beloved Asics 2160 and 2170 running shoes gives you a good lesson on how to look at the next year's model a little more critically. Barbara, It was great to meet you. Here are some reminders. See the videos below also. Do the wall stretch for the arch up to 10 times daily. Ice pack bottom of both heels for 10 minutes twice daily. Do contrast bathing once per day in evening as a deep flush. Wear the Night Splint on one side for the next month, and you can start when you are sitting during the day to get used to. See me in 3 weeks or so. Email me at any time. the wall stretch, but not calf. month, and one side for the next month? Ok, heading out for my Sole this morning - thanks again! Bunion Bootie: Have any Readers Tried it? How To Cope With Pain Blog: Just Wonderful! !